Viewing topic "Has Yamaha ever made a Motif FX????" I am part of a backline company and we are getting a request for a Yamaha Motif FX!?!? I have been doing this job for most of my life, I have never seen or been asked for a Yamaha Motif FX 8 keyboard. I politely told the client that the keyboard did not exist. He pretty much called me and my partner a liar and told us that an XF 8 would work for his guy but not for him! That we must get the FX 8 for him for the concert date. I have looked on the Yamaha website and I have not found one thing other than a guy from Nigeria swearing he has an FX for me for 5,000.00. I’m gonna take a pass on him but would love to hear what this community thinks about this. Thank you! ...but I suspect that’s not in your inventory. Maybe the guy asking for the FX is a partner of the Nigerian. Motifs do have FX (Effects, that is). This all sounds very sketchy. It’s either some kind of scam, how? I have NO idea, or these people are a few sandwiches short of a picnic. 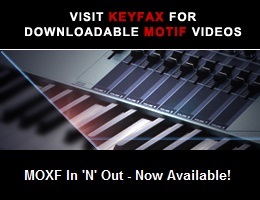 The only keyboards they could possibly mean are either a Motif XF 8 or a MOXF8. We could get into possible typos, but it’s tenuous. For example he might want a Motif ES 8 with a PLG150-DX board in it, the D is next to F on a qwerty keyboard so a typo could have come out as as Motif FX instead of Motif DX. Ok, You’ve started it. Who’s the artist needing an FX? Get him a wave runner and put it on stage. Who knows, maybe its part of their act. This reminds me of the last time I backlined a Yamaha. Told the BL Co I need a Motif XF7. Can they provide it - yes, sure. Called them to confirm 2 times, yes - XF7, we got it. Arrive at the gig, they show up 90 min before gig ... with an XS7. “What - aren’t these the same?”. uh, no, my library will not load into an XS and I have samples on this flash board that has no place to dock in the XS. Houston - we have a problem.